Introduce your kids to Shakespeare! Being that today is Shakespeare’s birthday, why not use that as an excuse to introduce your kids to Shakespeare? Not sure where to start? You’re in luck, because I’m bout to give you a guide! Start here: The Folger Shakespeare Library has an excellent site for teaching Shakespeare to kids. 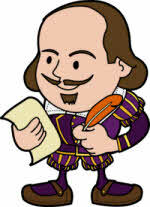 Filled with activities, facts, challenges and introductory Shakespearean word definitions, this web site will give you a lot of educational content to share with your kids. No Sweat Shakespeare: This collection of Shakespeare stories are rewritten in simple English that kids can understand. They also pass over all the violence and lewd jokes (no fun for adults) which is perfect for younger kiddos. Shakespeare 4 Kidz: If you are a bit more ambitious (and you should be), you can get these shortened, kid friendly Shakespeare plays to put on with your kids’ school, church group, friends, etc. Everyone learns and has a great time! The best thing about all of these options is that they get kids interested in Shakespeare’s stories. The younger they are when they start learning the basics of Shakespeare’s work, the more interested they will be when they have to read that mandatory Shakespeare play in high school. And hopefully they will start taking an interest in not only literature, but theatre as well! Win win!